2011's Annual Montauk Beach Group Class and Field Trip to Gosman's Dock. Are you looking for dog trainers in Suffolk, Long Island? 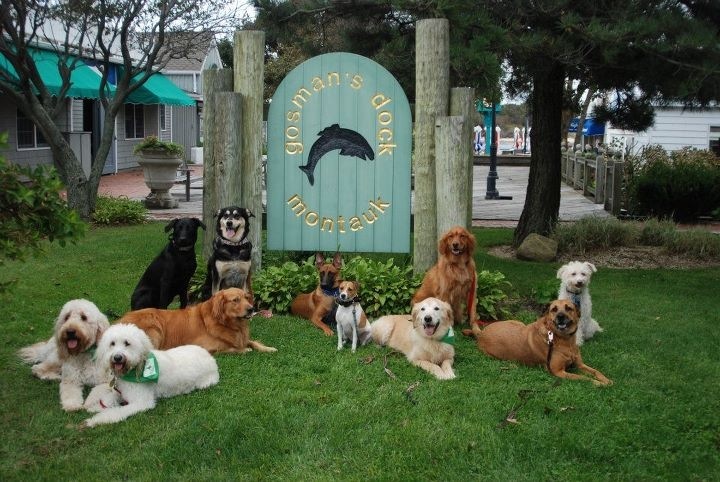 There are a lot of great dog trainers in Suffolk County, but only Best Friend's Dog Training has trained over 6,000 dogs; including family pets, Westminster show dogs, Police/Narcotics detection dog and therapy dogs. We've been in business on Long Island since 1999 and are a proud member of the Long Island community. Dogs in the suburbs have some great opportunities! Long Island dogs can take advantage of great Suffolk County dog parks, backyards and friendly neighbors. Well-behaved dogs need to know how to be polite and friendly to neighbors, kids, other dogs, joggers, bicyclists and strollers. Dogs need to know how to come when called and be friendly in busy shopping centers and with lots of distractions. Does your dog do all this? Is your dog trained both on the leash and off-leash? Best Friend's Dog Training can train your Long Island dog. Fear of bikes, boards, strollers, etc. In these private dog obedience classes, a dog trainer will work with you and your dog and teach you how to train your dog. This is an ideal program if your dog is displaying negative behaviors in your home. Because we have a team of trainers, our schedule is flexible and you we will work with you to find an ideal time for training. We come to you, so you don't have to drive! This is our two-week boarding program that is followed up with private lessons in your house. This is our most referred program. The Board and Train option is great for families or busy dog-owners that have little time to train their dog, are planning a vacation, are pregnant, or their dog is physically stronger than they are. We can include housebreaking. Just ask! Both of these programs are Lifetime Membership programs and all clients are welcome to our weekly group classes FREE for the lifetime of the dog. You are welcome to attend our unlimited group classes. We have weekly classes in Melville and Wantagh. All of our training programs include a Lifetime Membership to the Best Friend's Dog Training Community. This unique benefit is for the life of your dog and provides unlimited follow-up group classes, annual picnics and group events for dogs. You will also receive a discount on boarding. Lifetime Members have unlimited access to weekly classes to continue your training, learn new skills and improve socialization. A dog must be at least 4 months old to start training. Vaccines, including Bordatella are required for the Board and Train program. Do you have a puppy? Consider our Puppy Kindergarten Classes. Need training you don't see here? Have more questions? "If you keep coming, we'll keep teaching." Have you unsuccessfully tried other trainers? Flunked obedience school? We've heard it all! The problem isn't you, or your dog! One of the reason other trainers don't work is that the trainer didn't successfully teach the owner. When you have the tools you need to train your own dog, we see success! We also see trainers stuck using one method, and that method may not work for the dog or the owner. This is a shame and a waste of time and money. Best Friend's Dog Training understands that telling someone to "do this" is not good enough. You need to understand why you are doing something. We know it takes some people longer than others to understand what is being taught. That's why we offer One Price for the Life of the Dog. We give free in-home evaluations so you can ask us all the questions you want and there are no surprises. 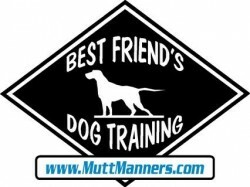 Best Friend's Dog Training boasts a team of reliable and successful dog trainers. No matter what your schedule or availability, we have a trainer that can work with you. Learn more about our staff. Puppies have different needs and expectations then older dogs. The impressions we make on a young dog will affect the puppy for life. We will teach puppies using positive-only reinforcement and if you choose, clicker training. We offer both puppy classes and private, in-home instruction. Deer Park, Sag Harbor, Islip, Stonybrook, Kings Point and more!